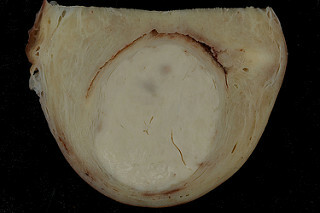 Uterine fibroids, also known as leiomyomas, are a common cause of women's infertility. Both surgical and non-surgical treatments of uterine fibroids may greatly increase a woman's chances of being able to conceive. Fibroids occur where muscles and connective tissue have grown into the lining of the uterus. Since fibroids contain estrogen receptors that stimulate the growth of the tumor when estrogen levels are higher, usually during the first half of a woman's menstrual period, before ovulation occurs. Tumors near the openings of the fallopian tubes can swell every month long enough to block the exit of the egg, and then shrink during the second half of the menstrual period when estrogen levels decline. If a woman who has uterine fibroids manages to get pregnant, the first trimester can be very difficult. A woman's body releases enormous amounts of estrogen to stimulate the growth of the placenta to hold and nourish the unborn child. This estrogen can greatly stimulate the growth of the fibroids as well, and the pressure on the womb can result in spontaneous (unplanned) abortion. Depending on placement, the fibroid may also interfere with the birth of the child and result in much greater post-partum bleeding. About one in nine women of European descent develop uterine fibroids, compared to one in three women of African descent. Approximately 97 percent of fibroids occur in the uterus; only three percent are found in the cervix. Most fibroids do not grow through the endometrium, but only put pressure on the uterus. For this reason, up to 90 percent of women who have uterine fibroids can become pregnant, although the other 10 percent will need medical treatment. Women who are hoping to get pregnant, of course, cannot have their fibroids treated with hysterectomy. Fibroids can be individually excised by surgery, removed with a laser therapy called UAE, or removed by a "foam" therapy involving the introduction of hundreds of tiny bubbles into the fibroid, a process called embolization, to interrupt blood circulation. Even after fibroid treatment, most women are able to become pregnant and the risk of future miscarriages is greatly reduced. A very simple step often forgotten by gynecological surgeons and their patients, however, is an absolute must before any treatment for fibroids. Sometimes women scheduled for fibroid removal are in fact pregnant.